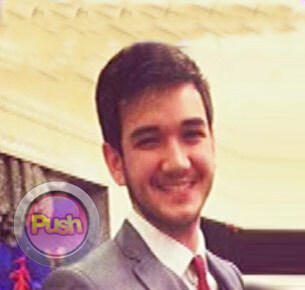 Muling Buksan Ang Puso Matt Evans is officially off the market for he has already tied the knot last October 3 with his girlfriend Katrina Fariñas. Matt’s wedding became known to the public via a series of posts which he made on his Instagram page on Thursday. 100713-matt-main.jpgThe other photos included photos of the couple in what appears to be during their wedding ceremony and with their wedding guests. The 26-year-old actor confirmed the news during a phone interview with The Buzz aired on Sunday. According to him, their private civil wedding ceremony took place on October 3 at around 11:00 a.m. and was attended only by their closest friends. “Napagusapan naming ng mommy niya, ng mommy ko na ‘yung mga sobrang close nalang, ‘yun nalang ang i-invite tapos pagka tumagal-tagal ‘yun na ‘yung church wedding,” shared Matt. Since Matt’s wedding came unannounced, many cannot help but make assumptions as to the true reason behind their “hasty” union. Meanwhile, his co-PBB housemate Gerald Anderson expressed happiness that his friend has finally settled down. “Congratulations! Sobrang happy ako para sakanya and si Matt nasa tamang edad naman eh. Well God be with you, sana magkaroon kayo ng malaking pamilya,” wished the Bukas Nalang Kita Mamahalin actor via a taped interview aired on the same The Buzz episode. Recall that roughly a year ago, Matt hogged headlines when his then-girlfriend Johneline Hickins accused him of physical abuse. Matt, who was imprisoned for a day, has denied the said allegation.